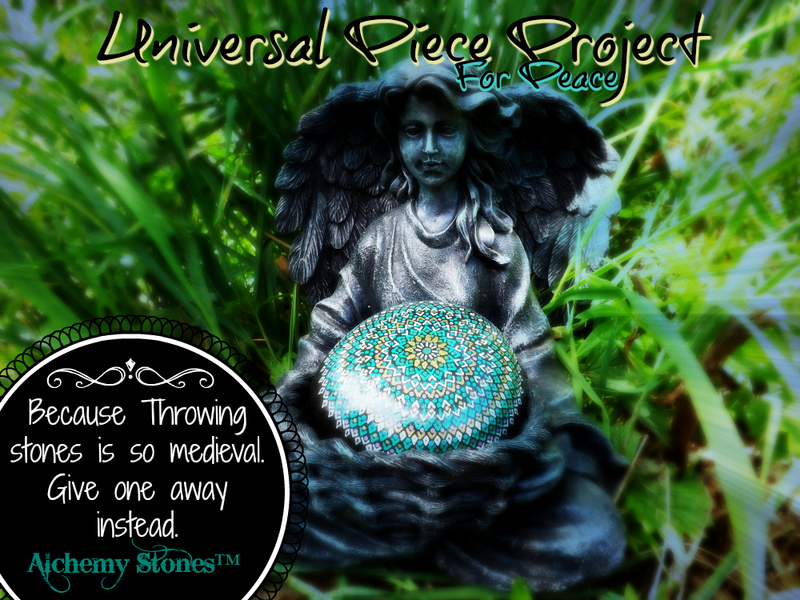 The Universal Piece Project, for peace. An age where stones are used to connect lives, not destroy lives. An age where stones are used to create foundations and bridges, not fences or blockades. Welcome to "The Universal Piece Project .. for peace." The goal is to create an Alchemy Stone for each continent, around a central stone representing Gaia. You're looking at that stone in the "basket of the Angel" in the picture to the right. You are invited to sponsor one or more of the grid stones Peter is creating for your nation, country, state, city, town or village -- and we will add your marker to "The Map" where you will be able to see "The Grid" of peace grow with every "corner stone" of hope. Your stone and marker will also be included in the UPP Archive forever. You'll send us a picture of your Alchemy Grid Stone, tell us where you placed it (latitude and longitude) as well as a video and/or the story behind it. This project will be available for future generations and is part of the White Light Express Trust in development right now. As artists and visionaries, we're continuously seeking exponential, practical ways to secure our success as a unique species without suffering or starving. Each stone you sponsor will assist in securing a permanent "quantum energetic pulse" (a kind of psychic EMF) dedicated to Peace and promoting peaceful communication without violence on this planet and throughout the Universe. We welcome you to sponsor your Continental Stone which is part of the permanent collection in residence at The White Light Express for any amount you are inspired to donate. At this time, the White Light Express is obtaining 501(c)(3) status ― however your contribution is not yet tax deductible. Please join our mailing list to stay updated on that progress, as well as other projects and specials. Use the form below to contact us with your choices and questions. Once we recieve your order we will send you a separate invoice from PayPal.